Optical slicing (the original name for focus stacking), real vs. synthetic stereo, motion control for macro 3D animations, stacked and stitched 3D video. Basics of synchronization. Goals and methods of testing. Remote ports: the problem of polling. Outliers. Effects of focal plane and rolling shutters. Alignment of pairs and uncorrectable errors. Phantograms may seem old hat in the 3-D community, but to everyone else they often represent the best and most immersive 3-D imagery they've ever seen. Bring your stereo or 2-D cameras along to take a few phantogram shots, and learn to process them in Photoshop and StereoPhoto Maker. Making and selling captivating books has a lower cost threshold than you might think. You have great images, so what now! Let's talk about the practical considerations that will help avoid project compromises and save money. We will create an image one layer at a time while talking about artistic choices and technical limitations. What low-tech options are available to step up your shot? Sometimes called by the acronym SIG or "Birds of a Feather" meetings, these meetings are an opportunity to discuss various aspects of 3-D with other individuals with similar interest. The meetings range from informal discussions to formal meetings Please check the schedule or pocket guide for meeting times and places. All members of the convention are welcome to attend any session. Subject to change. 3D Movie Makers, CA John Hart - Interested in making 3-D movies or are you currently making 3-D movies. Come discuss with individuals who have made several Do-it-yourself (DIY) films. 3D Phones and Tablets, Andrea Shetley - We will discuss and show 3D phones (for viewing and/or photographing) and tablets, including hardware, apps, and viewers. We also will discuss how to make 3D images on your regular smartphone. Bring your phone and/or tablet (with images loaded) and/or viewer to show! This is an open discussion format to share information, tips, and images. First-Timers, John Bueche & Barb Gauche - Is this your first 3D-Con or are you an old pro and want to mentor a newbie? If you are new to 3-D, stereo photography or NSA conventions this is a good place to come to find answers to your questions. Lenticular DIY, Michael Brown - For lenticular makers and people interested in making their own lenticulars. This is separate from his workshop. Medium Format Shooters, Linda Nygren - If you create medium format stereo views, or would like to talk to those who do. We'll be talking about challenges, techniques, tips, and hints. 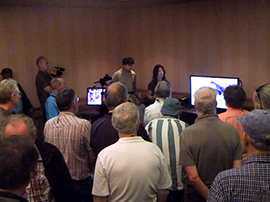 This free-for-all may involve image sharing or equipment show and tell; this is a tech & talk meeting. View-Master, Mary Ann & Wolfgang Sell - History of View-Master Show: A special digital presentation prepared by Wolfgang and Mary Ann Sell. Meet other VM collectors and fans, enjoy the history of View-Master, get your questions answered and find out about the latest news in the View-Master world. Vintage, Linda Nygren - Sign up in advance or just drop by, bring a stereo-slide viewer and slides or enjoy other people's old images. This annual get-together has people sharing and selling stereo slides. VR - For viewing and taking 3D VR images. Immersive. 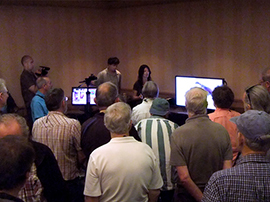 A packed workshop at 3D-Con 2012 for "Alioscopy Trigger in Adobe Photoshop CS6 for Auto-stereoscopic 3D Display" by Pia Maffei and Doug Betzold. Stereo by John Dennis.